Though he may be most noted for his work as a lawyer and political commentator, David Limbaugh’s recent interests have included topics related to Christianity. His most recent bestseller, The Emmaus Code: Finding Jesus in the Old Testament, is an attempt to demonstrate how Christ is the central message of the Old Testament. Limbaugh’s breakthrough in understanding the Old Testament came when he understood the centrality of Christ within it, and he hopes this book will guide others toward the same appreciation of the Old Testament’s Christological witness. The title of the book is a reference to Luke 24:27: “And beginning with Moses and all the Prophets, [Jesus] interpreted to them in all the Scriptures the things concerning himself.” Limbaugh believes this text is in Scripture because God intends for all Christians to experience the kind of breakthrough those two travelers on the road to Emmaus experienced. The Emmaus Code begins by defending the Old Testament as a profitable portion of the Bible. Limbaugh then gives a summary of Old Testament history, which he believes aids readers by providing a broad perspective of how the various parts fit together. This historical perspective is the key, according to Limbaugh, for understanding how the Old Testament points to Christ. In the next section he explains important concepts such as covenant and typology. Limbaugh will frequently refer back to these concepts in the final section of The Emmaus Code, which gives a book-by-book examination of how the Old Testament testifies to the coming Messiah. 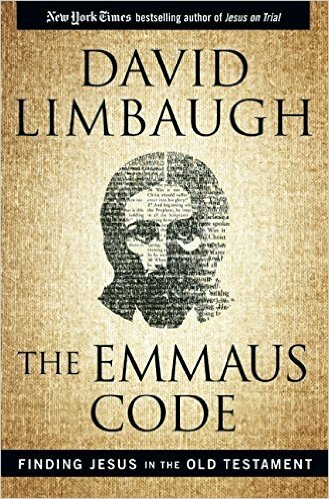 Overall, The Emmaus Code is a fine example of Christological biblical interpretation and will benefit a lay audience, even if readers don’t share Limbaugh’s dispensational outlook. Two aspects, I believe, help the book stand out. First, Limbaugh notes the importance of progressive revelation for understanding how Christ is revealed in the Old Testament. “Progressive revelation” simply means the original audience (and even author) didn’t share the same perspective as New Testament readers. While the Old Testament does contain legitimate testimonies to the person and work of Christ, many of these passages can only be understood as pointing to Christ retrospectively. Though always present, an Old Testament text’s Christological significance only becomes clear in light of subsequent revelation. Progressive revelation is vital, then, since it allows us to affirm the Old Testament’s Christological significance without straining the text beyond what it can exegetically sustain. Limbaugh generally allows for Christ-centered passages to emerge with the help of later revelation. Thus he remains true to the concept of progressive revelation, which he describes early within The Emmaus Code. For a popular level book, this is a commendable feat. Second, Limbaugh balances his conviction that Christ is the main theme of Scripture with his acknowledgement that Scripture’s message is wider and more complex than this theme alone. One danger in stressing Christ-centered interpretation is it can leave the reader thinking the only topic the Bible addresses is Christ; the central theme becomes the only theme. Limbaugh, however, frequently notes instances when, though Christ remains central, a biblical passage addresses a wide array of concepts. Though The Emmaus Code has many positive aspects, it also has weaknesses. It’s noteworthy Limbaugh holds strongly to the historical reliability of the Old Testament, but his emphasis on history obscures the significance of some Old Testament books. He draws little distinction between text and event. More importantly, he doesn’t consider a book’s date of composition as a key indicator of the author’s intended message. Instead, he just focuses on the historical significance of the events described within the given book. The most telling example is his discussion of 1–2 Chronicles. If read merely for historical material, much of their significance is mitigated since they essentially relate the same information as 1–2 Kings. If it’s acknowledged, however, that 1–2 Chronicles were written to the returning exiles at the end of Old Testament history, then we may contemplate what the author’s purposes are: rehearsing Israel’s history for those who’ve resettled the land over 100 years after the events described. This opens new options for considering the message and purpose of 1–2 Chronicles, which aren’t available if these books are only mined for the history they relate. The Emmaus Code is essentially an overview of the Old Testament’s witness of Christ. The problem every such overview will encounter is inevitably gliding over difficulties that would be encountered in a detailed examination. Limbaugh frequently notes instances, for example, where the New Testament quotes the Old Testament to indicate its Christological significance. These New Testament quotations of the Old, however, often create significant exegetical and hermeneutical challenges that Limbaugh fails to acknowledge. For example, Limbaugh notes the use of Jeremiah 31:15 in Matthew 2:17–18 but doesn’t address any of the questions surrounding Matthew’s use of the Old Testament in this instance. The final evaluation of The Emmaus Code will depend on one’s familiarity with the topics addressed. The book could provide a lay audience with an solid invitation to consider new avenues for understanding the Christological significance of the Old Testament. On the other hand, most pastors and biblical scholars will desire a more in-depth treatment of the material covered and may, at times, be unconvinced by many of Limbaugh’s exegetical and theological decisions. David Limbaugh. The Emmaus Code: Finding Jesus in the Old Testament. Washington, DC: Regnery Publishing, 2015. 420 pp. $27.99. Casey Croy is a PhD student in biblical theology at The Southern Baptist Theological Seminary. He holds degrees from Southeastern Baptist Theological Seminary and The Queen’s University of Belfast, Northern Ireland. He currently lives in Louisville, Kentucky, with his wife and newborn son.